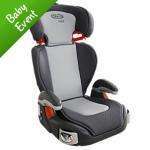 Graco junior maxi car seat suitable for 4 years plus, group 2 and 3. Was £39.99 now £25.00 online and instore (selected only) , online orders subject to £4.95 delivery charge or free if delivered to store. Not a good enough seat for my son, sorry, but I value him too much. Sometimes, you get what you pay for! Sorry disagree all car seats must conform to ECE regulations R44.03 or R44.04 and all are subject to the same performance tests that they must pass. Sorry disagree all car seats must conform to ECE regulations R44.03 or … Sorry disagree all car seats must conform to ECE regulations R44.03 or R44.04 and all are subject to the same performance tests that they must pass. That's what cheapskates tell themselves!!! Considering this stage seat lasts for about 7 years, why not splash out and buy something half decent, then relax, knowing your children are safe. had excellent rewievs -185 of them, s I ordered one. I am very pleased with this brand anyway. I always thought it was the seatbelt that saved lives , silly me i didnt relise it was my seat . You're not a 4 yr old I'm assuming! Yes they all meet a minimum standard but other ones offer better side impact protection. My friend is a childminder and has one of these for her mindees, when we compared it to our Cybx one and there was a obvious difference in quality. The Graco seemed a lot flimsier. I always thought it was the seatbelt that saved lives , silly me i didnt … I always thought it was the seatbelt that saved lives , silly me i didnt relise it was my seat . What a staggering thing to say, we're talking about young kids here, not adults so it's very different. If you don't know this and you have a child, I suggest you do some research. wait until its drops to £15 or £12.50 like it does every year. We have one and it is very light, this thread has me worried now. I think the difference of this seat and others is the padding in the seat and the sides of the headrest if you go deluxe you get lots more padding, im sure if it wasnt safe they wouldnt allow it to be used in the Uk. Cant believe some of the comments on here, some people dont even put there kid in a child seat, I have had this one for 2 years my son is now 6 and he will be using it for a few more years yet, and btw I really love my son funnily enough. The safety debate happens everytime this is on offer at ASDA. I bought one and am happy, because at the end of the day the seat belt is the most important thing. I did panic reading the reviews first time around BUT what did we have as kids? Not even a belt when we were little. The new regulations that were put in place due to height etc were only a couple of years back. We've got one of these not impressed but ok for the money I guess. not enough side support if the child falls asleep they can fall sideways almost out of the seat - had to poke the boy several times now when he's gone akip in it. If this is the slightly remodelled one that horrificially failed the Which tests awhile back, not sure what they've done to improve it but probably not much I suspect. As for those going on about the standards those are the MINIMUM safety standard for the car seat to go on sale, in the event of an accident the difference between the minimum and a better seat could be taking your child home from hospital or not! The Graco are obviously better than nothing BUT the Mamas and Papas Cybex seat (which i've just ordered) is currently available for £55 online (half price) you get £5 gift card for signing up to their mailing list and 8% quidco back for new purchaser so is this seat REALLY worth it for £25? I really hate the silly what did we do as kids rubbish that gets spouted around - errr kids had a tendancy to get killed in the event of an accident (as did adults with no seat belt) try looking up road safety figures from the 80's and now for example - ok some will be down to improvements in car design but not all. I think the difference of this seat and others is the padding in the seat … I think the difference of this seat and others is the padding in the seat and the sides of the headrest if you go deluxe you get lots more padding, im sure if it wasnt safe they wouldnt allow it to be used in the Uk. I'll have to cut down on my side impact collisions in future then. My wife bought our daughter a new seat and there is a big difference in the padding, I will be keeping an eye on freecycle for a new seat. There is conforming to minimum standards and exceeding them. I'd prefer the latter. Which criticised this seat on its poor side impact protection. Asda is always shifting theses cheap seats. Those who are hostile to this argument can put their head in the sand because in the even of a crash from the side it won't be them but their kids paying the price for saving a few quid on the seat. User reviews are worthless and can only judge the look and feel of the seat _I am assuming the users haven't all commissioned crash tests. We bought this from one of the supermarkets when it was around £17 or so. As others have pointed out, you get what you pay for. This is cheap and flimsy and the headrests are not to my or my daughters liking. This will be binned very shortly as I am now looking for a good car seat and will not spare any expense. The only reason is extra comfort when my daugthter dozes off in the car. You see another person that lives in Derby that likes a bargain like me. Like this with the head rest recliner - have you tried and tested it? Only ordered it today but paid for the which report which gave it 4/5 stars on nearly everything with 3 5/5 stars too. Theres a thread for it on here if you bang Cybex into the search top right someone might have one already who can comment. We have compared it to a Graco one and a Britax adventure and I know which one I'd put my kids in! Looks really good. Have just skype my hubby, as like the look of the fact that removes the nodding head!!! - Thanks for this. Yes I've got two and have been very impressed with them, this was my … Yes I've got two and have been very impressed with them, this was my original posthttp://www.hotukdeals.com/deals/cybex-car-seats-1-2-price-55-at-mam/845521We have compared it to a Graco one and a Britax adventure and I know which one I'd put my kids in! So no nodding heads then??? why does this debate happen each and every time asda has a baby event!! Its any parents choice of what car seat they use on their own child so shouldn't be made to feel inadequate by picking one of these car seats. Oh by the way I was in a 4 car pile up right in the middle. My 2 DDs who were 3&4 at that point were in one of the graco booster seats, yes they did have the more padded deluxe ones, but still this style of seat and they came out with 1 bruised arm out of 4 and just scared of car for a bit. Insurance gave me money to replace my girls car seats, I went and bought another 2 graco ones as they served my children well when I needed them most. My son now has one too. why does this debate happen each and every time asda has a baby event!! … why does this debate happen each and every time asda has a baby event!! Its any parents choice of what car seat they use on their own child so shouldn't be made to feel inadequate by picking one of these car seats.Oh by the way I was in a 4 car pile up right in the middle. My 2 DDs who were 3&4 at that point were in one of the graco booster seats, yes they did have the more padded deluxe ones, but still this style of seat and they came out with 1 bruised arm out of 4 and just scared of car for a bit.Insurance gave me money to replace my girls car seats, I went and bought another 2 graco ones as they served my children well when I needed them most. My son now has one too. Of course it's any parents choice, is anyone on here stopping you or anyone else buying them or having your choice? No didn't think so. the reason we have this discussion every time is that there is a balance between a bargain and going too cheap in some peoples opinion. safety factor aside these Graco seats are bloody hard there's only a tiny amount of padding between your child and the resin/plastic seat itself. I agree the seat i use for my son now takes up more than one seat so cant use all 3 back seats so when i use the asda seat it will only take up one seat so i can have the use of the other 2 seats one again. Has the extra padding, but I only bought that due to comfort as I do long motorway journeys with them often. "I'm sure you bought with the best intentions"